Here is a great lecture by Dr. Peter Kwasniewski. I suppose a brief (and poor) summary might be: While the core essence of the Mass is Christ offering Himself on our behalf to the Father, all the other elements of the Mass are also important because it is through the “accidents” of the Mass that we have access to the “substance” of the Mass. This is true not only for the Eucharist and the doctrine of transubstantiation, but everything else, the smells and bells, kneeling and genuflecting, chant and prayers, etc. Why the Modern Age Needs the Mass of Ages, I look forward to finding anything else he has done. Dr. Kwasniewski is a particularly eloquent spokesperson for the usus antiquior. His lecture is perhaps a bit technical, but still easy to follow, and worth the listen. I thoroughly enjoyed it. I myself have been interested in this topic, especially the physicality of worship, for some time. Three years ago, after I had begun to make a more concerted effort to pray in the morning, I wrote on the physicality of faith. And more than four years ago I wrote a piece on reducing faith and worship down to some absolute minimum, which I called an inhuman experiment. When I was a Protestant I didn’t believe in the Real Presence of Christ in the Eucharist (I didn’t even know that was an option), and I also believed the Church very quickly became corrupted after the apostles died. That’s why I “knew” our Baptist church was Christian and Catholics were probably going to Hell — nearly two thousand years of corruption until we Baptists came along finally with the true faith of the apostles. In other words, the Eucharist (we called it communion because Eucharist was too “Catholic”) was only a symbol and, of course, any authentic Christian church had to look like the church of the first generation of Christians (whatever we imagined that to be) if it looked like anything at all. I now know this is a lot of foolish bunk, but still popular in many Protestant circles — although those circles seem to be getting smaller and smaller. One important piece of evidence for a Church of continuity through the ages is the simple fact that a mere few years beyond the first apostles others made statements about the Eucharist that confirm the Catholic teaching, and those others, lo and behold, where connected directly with the apostles. In other words, the Catholic understand of the Eucharist came directly from the apostles, who got it directly from our Lord. Notice the relationships, see the connections. Now consider Christ’s words: “And I say to thee: That thou art Peter; and upon this rock I will build my church, and the gates of hell shall not prevail against it.” (Matt. 16:18) Even Hell will not prevail. It seems to me that the Church has always been a Church of sinners, of struggles, of setbacks, of divisions, but also of healing, reconciliation, and of saints. It has also been a Church of the Eucharist. To think the Church got off course as soon as the apostles died is truly silly. To think the Catholic concept of the Real Presence in the Eucharist is a made-up doctrine that came centuries later is also silly. *FYI: if I redo this chart I would make the lines between Paul, Peter, and John dotted, or something other than solid lines. However, not everyone liked it. The video is specific to the Mass attended by most Catholics in the Archdiocese of Portland, the Novus Ordo Mass. The two ways presented in the video are receiving the host on the tongue while standing and in the hand while standing. What many objected to was the absence of presenting how to receive on the tongue while kneeling. Nearly every twitter commenter challenged the video, saying the video should have at least included how to receive kneeling and on the tongue, and some called for receiving and standing to be banned altogether. Nearly zero positive comments. Keep in mind this is the Archbishop who recently celebrated Mass in the usus antiquior form at the Basilica of the National Shrine of the Immaculate Conception in Washington D.C., broadcast live on television. He is committed to the growth and resurgence of the Traditional Latin Mass. 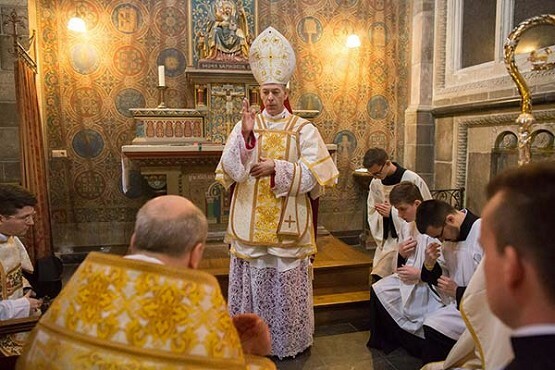 He is actively making incremental changes in his Archdiocese to bring about more reverence for the Eucharist, including the reinstitution of kneeling after the Lamb of God in the Novus Ordo Mass. Those who despise the NO will criticize this move, but it is a step in the direction of greater and more appropriate reverence within the dominant NO landscape. This is a good thing (especially in the region of the U.S. where the “nones” dominate more than in any other area). First, Catholics have been indoctrinated over the past 50 years with some rather significant and, at times, very troubling assumptions. They tend to believe that the old traditions are a sign of rigidity. Many Catholics even think receiving the Eucharist on the tongue while kneeling is, at best, a weird act of misplaced piety, and most likely an act of pompous showiness, and at worst actually sinful. These are, of course, much like basic Protestant beliefs that come from the idea that true, authentic faith and worship must have nothing else attached to it other than one’s own inner feelings. Therefore, conforming to outward standards of reverence can’t be anything other than pretension, and therefore must be resisted and even eradicated. But this is a false religion born out of a bad anthropology. But if we are to change these ideas, and encourage Catholics to kneel and receive on the tongue, then we first have to address the ideas head-on and not force outward behavior that might, strangely and ironically enough, cause scandal. We have inherited a kind of Gordian Knot that will take faith, prayer, wisdom and, of course, the work of the Holy Spirit to undo. Second, culture runs very deep, and is made manifest in habitual actions. Those actions are typically copied from others. Human beings become who they are largely by copying what everyone around them is doing (for good or bad). This is how societies are generally formed. The fact that many Catholics treat the Holy Eucharist with somewhat irreverent actions and nonchalant ease comes from having those behaviors and attitudes worked into them by their surrounding culture. That culture includes specifically Catholic culture (what Catholics see other Catholics doing at Mass, for example), but also includes the pervasive consumerist, self-fulfillment, neoliberal culture of our profoundly influential modern age. To put it bluntly, a great many Catholics are simply blind to how their own actions declare a non-Catholic worldview (even at Mass), and they are probably incapable of not being blind except for the work of the Holy Spirit because the culture is so insidiously powerful and deeply ingrained within their souls (I should say within “our” souls, because you and I are affected too). Therefore, merely pushing hard for external changes assuming it will then automatically change people’s hearts and minds is foolish. If fact, it might push people away. This is why prayer is so important. It is also why loving and befriending others while also being the change you want to see may be the best way to encourage change in others. Third, receiving the Eucharist on the tongue while kneeling is based on some fundamental theological dogmas and assumptions. The traditions of the Church speak to centuries of working out the Church’s dogmas and assumptions into appropriate actions, such as the actions of the Mass. If one is ignorant of those fundamental dogmas, then being asked to do something that feels weird and awkward will be resisted. Rather, teach the right fundamentals so well and so frequently that the Church will clamor for communion kneeling and on the tongue, as well as a number of other traditions now seemingly lost to history. The video above may help by reorienting people’s attention to the idea of reverence for the Real Presence, and to the fact that our actions actually mean something and have real consequences. That then can become a foundation upon which to build. Could the video be better, maybe. Is it a start, absolutely. Is it an appropriate way to reach the Novus Ordo crowd? Yes. I believe one of the best ways to get the Church be become more reverent would be for bishops to have their priests preach repeatedly each Sunday on the Real Presence and related topics. Reinstitute that fundamental belief, and much good will follow. If done well, and assuming the priests have been taught well and actually believe the truth, then I am convinced that after a year (perhaps sooner) the laity will be demanding a lot of the old traditions be reinstated; perhaps accompanied with weeping for what has been lost but what can still be recovered — weeping tears of sorrow and joy. For now, though, encourage reverence wherever and however you can. Pray that the Holy Spirit will blow the “smoke of Satan” out of the Church, and that true worship and authentic faith will begin to flourish like never before. And be sensitive to where your fellow Catholics are in their everyday lives and understanding, and pray that we have strong, courageous, and faithful bishops. The following is a lecture on beauty and sacred art by Jed Gibbons, artist, designer, and vice president of the Catholic Art Guild, which is based out of the beautiful St. John Cantius Church in Chicago. Fr. Weinandy has been gaining some attention for his rigorous stance against the machinations of modernism and their corrosive nature within the Church. He has been critical of Pope Francis, which you may or may not find a good thing. He has also called out the evil intentions of some of the Church’s leadership which, if he is right, then that’s a good thing. My take is that he is both good and wise, and that he seeks truth and righteousness. Of course, this does not make he automatically right, but I am certainly less inclined to say he is wrong, but I do not know enough to critique his critiques. He also seems to me to be on the right path, and brings with him a gentle spirit combined with a love of truth.